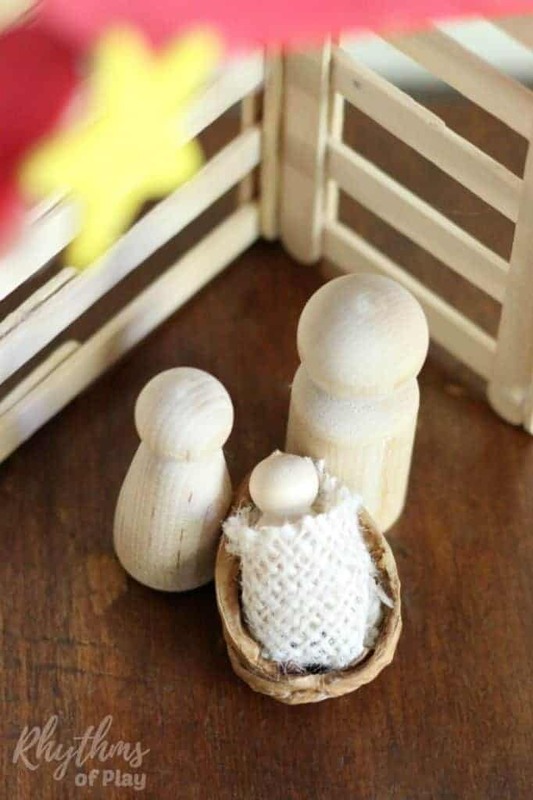 Make this easy DIY wooden peg doll holy family nativity scene to display as home decor this season. A simple Christmas craft for both kids and adults that will add a touch of magic to your holiday decorations. We live across the street from an almond and walnut orchard. After harvest, there are always strays that don’t get picked up by the harvesting equipment. The owner has told us to pick up and take any stray walnuts we find after harvest so they don’t go to waste. My daughter and I had just finished our simple stone advent calendar and craft stick nativity stable when we brought home handfuls of walnuts from the orchard one day. Placing baby Jesus in a walnut half shell is a perfect addition to our nativity scene. 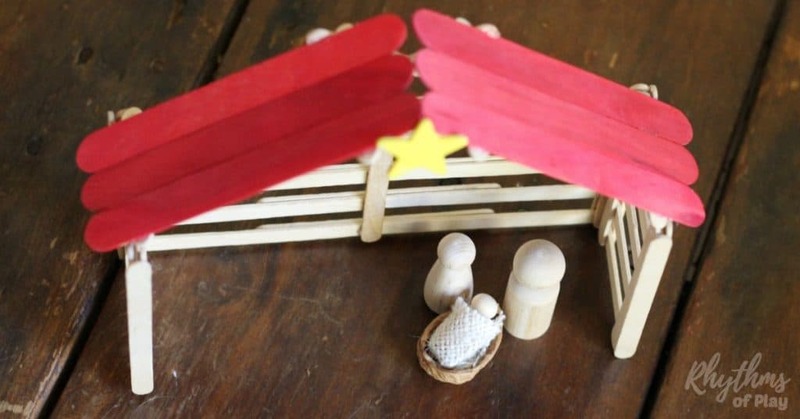 There are a few ways to make this simple nativity craft depending on the supplies you have available and how you will be using it. To make one using a wooden peg doll as shown in the photo above follow the directions below. For directions to make one using a wooden bead instead of a wooden peg doll click on the link. Skip the step of adding twine if you won’t be hanging it as a Christmas ornament. Glue guns are hot and dangerous tools. Children must be under direct supervision at all times when a glue gun is plugged in. The wooden peg doll set listed above will give you enough peg dolls to make these peg doll elf ornaments, these rainbow peg dolls, and these winter fairy peg dolls too! The rainbow peg dolls make a great gift idea for the kids. They are perfect for pretend play and color matching games. If you’re wondering how to crack a walnut to get at least one usable half I’m afraid I’m not much help. My daughter loves cracking walnuts and eating them so I placed a bowl of walnuts in front of her and let her have at it. She ended up with a tummy full of yummy walnuts, a pile of shells, and a handful of useable halves. I had placed a bunch aside just in case there were no useable halves in her discards but I didn’t have to crack them. Not bad for a four-year-old! Go ahead… Pass the walnut cracking off on the kids. It’s a fabulous hand strengthening activity! We cut our burlap scraps from a sewing project we did a while back. You will need one small square or triangle of burlap big enough to swaddle the small baby Jesus peg doll for each walnut half. 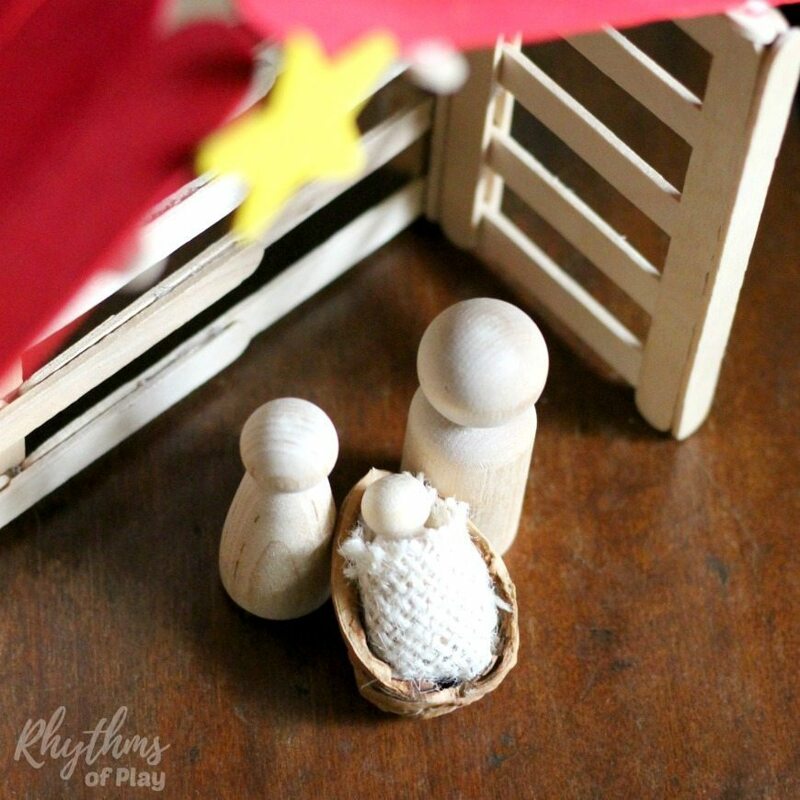 Wrap the smallest wooden peg doll in this set up in a scrap of burlap. 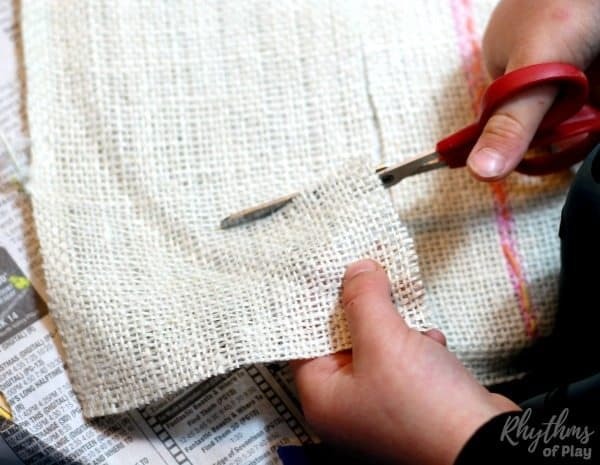 We tried this a few times in a few different ways using different shapes of burlap scrap and they all worked perfectly. All you need to do is swaddle the wooden peg doll in burlap and glue it down using a glue gun in any way that works. It doesn’t need to look pretty because you will be shoving it into a walnut shell half messy side down. When we put the peg doll above in a walnut shell we placed the top (messy side) that you see down and tucked the ends into the walnut shell. I held the walnut shell for my daughter so it was easier for my daughter to add glue and baby Jesus. Please make sure your children are mature enough to handle a glue gun before inviting them to help make this peg doll baby Jesus in a walnut shell manger. Fill the 1/2 walnut shell with a big dollop of glue. Quickly tuck baby Jesus in burlap into the shell messy side down before the glue begins to dry. To complete this easy DIY wooden peg doll holy family nativity scene select a peg doll to represent Mary and another to represent Joseph. You can leave them plain like we have or decorate them in any way that you wish. Next place the baby Jesus in walnut shell manger with Mary and Joseph. As mentioned above, we have placed our easy DIY holy family nativity into a simple stone advent calendar with craft stick nativity stable. Click on the links to see all the fun pictures and learn how to make your own! 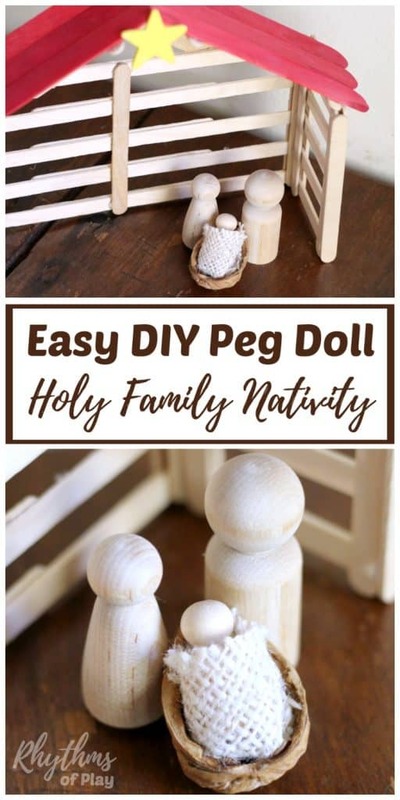 Make this beautiful easy DIY wooden peg doll holy family nativity scene to display as home decor this season. A simple Christmas craft idea for both kids and adults that will add a touch of magic to your holiday decorations. If you liked this post you will love Meaningful Christmas Traditions for a Magical Holiday and our Winter Bucket List!